Our company "Ketambe Jungle Trekking & Tours" organize different kind of individual trekking tours into the jungle near Ketambe. Day walks and longer trekking tours from two up to seven days with overnight stay at different places are possible. Professional, experienced and English speaking guides will lead you through the rainforrest which is one of the last orang utan habitats in the world. Walking time, area and level of difficulty for the trek will be discussed and agreed with the guide. Our trekking tours include all necessary camping and cooking facilities, food and drinks. In addition we offer transport with private taxis to and from Ketambe. Please get more information and book via email - see contact. We are one of the very few employers in Ketambe. For our agency working about 8 guides and 15 porters, all from Ketambe. There is a rotating system, so everyone gets a job in a regular order. The Ketambe community appreciate this approach. We also care about junior guides. They gain experience as a porter first and get taught by senior guides during the trekking tours. How to come to Ketambe from ... ? 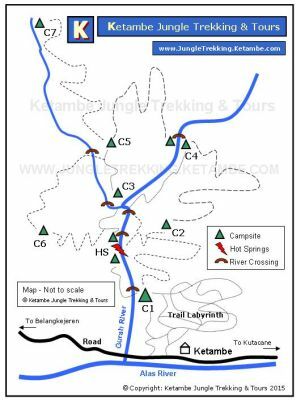 What to see in the Ketambe jungle ? Most people come to see orang utans and you will see them. But more animals can be spotted. Detailed description on What to see?